Persian low relief from Qajar era in the style of Persepolis, located at Tangeh Savashi. 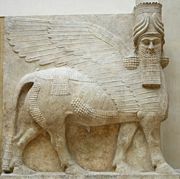 A relief is a sculptured art work in which figures are either carved into a level plane or, more typically, the plane is removed to create images sculpted on its surface without completely disconnecting them from the plane. It is therefore not free-standing or in the round, but usually has a background from which the main elements of the composition rise. There are three basic forms of relief sculpture: bas-relief (low-relief), in which the sculpture is raised only slightly from the background surface; alto-relievo (high-relief), in which part of the sculpture is rendered in three dimensions; and intaglio (sunken-relief), in which the image is carved into the surface material. Relief sculpture has a notable history dating back over 20,000 years in both eastern and western cultures. They are often found on the walls of monumental buildings. Several panels or sections of relief together may represent a sequence of scenes. 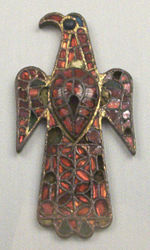 Generally, relief figures and backgrounds are sculpted from the same material, but there are a few exceptions in Greek art and in the decorative work of the Chinese and Japanese, and others who used inlaid ivory, gold and cloisonné techniques to form reliefs. Yaxchilan Lintel 24, a Mayan carving depicting a blood sacrifice. Although clay and wood were probably the earliest mediums of bas-relief, the first preserved relief sculpture originated with the stone-cutters of pre-history. Relief focuses more on contour than line and the use of chiaroscuro in defining form. It is believed to have pre-dated sculpture in the round, as it is easier to create than a free-standing full-figure. Bas-relief is very suitable for scenes with many figures and other elements such as a landscape or architectural background. A bas-relief may use any medium or technique of sculpture, with stone carving and metal casting being two widely used forms. In larger reliefs marble, bronze, and terra-cotta have often been used. In smaller reliefs, precious metals, stones, and materials such as ivory, stucco, enamel, and wood are used more often. The reliefs of the Egyptians and Assyrians were made more effective by the introduction of strong colors. The early Greeks also made use of polychromy, as seen in the metope relief in the Museum of Palermo. The human form was most commonly used in the Greek and Roman classic reliefs, quite often in processional order of historic or military events, or in the ceremonial of worship. The relief medium is also is well suited to the use of a series of scenes. A number of bronze doors of Italian baptisteries show illustrations of the Bible. 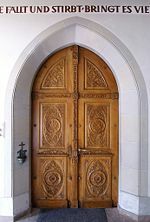 In Gothic art and in the Renaissance it was the custom to tint wood, terracotta, and stucco, but not marble or stone. A bas-relief (pronounced "bah relief"; French for "low relief" but derived from the Italian basso rilievo) is a form of surface ornamentation in which the sculpted projection is very slight or shallow. The background is very compressed or completely flat, as on most coins, on which images are typically in low-relief. The most famous example of low-relief is the frieze around the cella of the Parthenon, large portions of it are in the British Museum. The lowest kind of relief is designated by the Tuscan term rilievo-stíacciato, which scarcely rises from the surface upon which it is carved and is mostly made of fine lines and delicate indentations. Examples can be found in Donatello's Florentine Madonnas and saints. High-relief or alto-relievo, from the Italian, involves the undercutting of at least the most prominent figures of the sculpture so that they are rendered at more than 50 percent in the round against the background. However, the degree of relief may vary across a composition, with prominent features such as faces in higher relief. Themetopes from the Parthenon—now in the British Museum—is among the best-known examples of alto-relievo. All cultures and periods where large sculptures were created used this technique as one of their sculptural options. It is present in monumental sculpture and architecture from ancient times to present. Sunken-relief, also known as intaglio or hollow-relief, describes an image that is carved into a flat surface, with the images usually mostly linear in nature. This form is most famously associated with the art of Ancient Egypt, where strong sunlight and resulting heavy shadow is present most of the time. Included in this category is picture-writing (hieroglyphs), which was used to inscribe images on stone monuments and Egyptian reliefs. Hieroglyphs are also seen in various kinds of metal and wood inlay. In the sculpture of many cultures, including Europe, intaglio is mostly used for inscriptions, as often seen on headstones or buildings. Ancient cave art in the Franco-Cantabrian area of the Upper Paleolithic period included not only cave paintings and engravings but a few bas-reliefs. 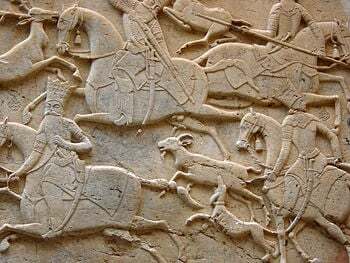 The Babylonians, Assyrians, and Hittites practiced both bas-relief and sculpture in the round. The Greeks conceived relief sculptures in a plastic sense—embodying high and low together. They used relief both as an ornament and as an integral part of a plan in conjunction with architecture. In the second and first centuries B.C.E. 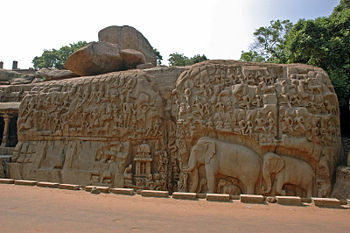 bas-relief sculpture was present in western India. The earliest find is on the porch of a small monastery at Bhājā, thought of as being the god Indra, seated on his elephant, and Sūrya, the sun god, in his chariot. Later in the first through fourth century India C.E., individually carved figures-either in high relief or in the round-replaced the earlier narrative tradition edifying rulers and gods. They used the high-relief between the triglyphs and the tympana of the temples, and low-relief in friezes, tombstones, etc. In Europe, the Hellenistic period saw a more picturesque carving style. Etruscan relief was mainly in artistic handicrafts. In Rome, the Arch of Titus, the continuously winding reliefs of the Column of Trajan, imperial sarcophagi in the Vatican, and reliefs of the Capitol Museum all reflect a pictorial style, revealing the influence of the Greeks. Panel from door of Santa Sabina showing a scene from an apocryphal Old Testament section of the Book of Daniel, "Bel and the Dragon"
Early Christian examples show much similarity to antique models in the form, pose, and drapery of subjects. Most examples can be found in the sarcophagi and catacomb burials with biblical, apostolic, or symbolic subjects such as Daniel in the lions' den, Moses bringing water from the rock, the adoration of the Magi, and the Good Shepherd. The myths of heathen beliefs were sometimes utilized and changed into Christian themes, such as the theme of Ulysses attached to a mast being transformed into Christ on the cross. Sarcophagus of Junius Bassus, 359 C.E. By the fourth century, Christian relief work of considerable quality began to emerge, such as the sarcophagus of Junius Bassus in the vaults of St. Peter's Basilica and several works in the Lateran Museum. Later basilicas, cathedrals, and churches included reliefs of a Byzantine character, followed by the Frankish and Teutonic styles. The bronze reliefs of the church of Saint Michael in Hildesheim, Germany are considered fine examples of the eleventh century style; those of the Golden Gate in Freiburg, are among the finest work of the late Romanesque period. As the Romanesque period merged into the Gothic, relief sculpture developed a new character and special importance because it was used in many aspects of the architecture of the time. Relief reached its fullest development in Florence with examples like the baptistery doors of Ghiberti and the marble pulpit of Santa Croce by Benedetto da Majano. Donatello used both high and low reliefs, as did Michelangelo. Others continued to develop the form throughout the late Renaissance through the nineteenth century in Europe and America, especially on civic buildings. During this period, reliefs became popular as an independent art form, especially for outdoor commemorative sculptures. 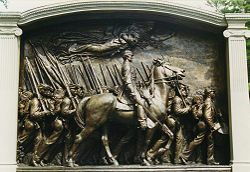 Robert Gould Shaw Memorial, by Augustus Saint-Gaudens, 1897, Boston, combining free-standing elements with high and low relief. Italian relief sculptors introduced the art to the United States when they were working on the federal buildings in Washington, D.C. The most adept American Neoclassical sculptor was the prolific relief artist Erastus Dow Palmer (1817-1904) from Albany, New York. Originally trained as a cameo-cutter, he produced many portraits and idealized subjects which inspired other American artists including his assistants Charles Calverley and Launt Thompson. Henry Kirke Brown studied in Italy (1842 to 1846) and moved the art form from Neoclassicism to naturalism and from marble to bronze. He created bronze high-relief medallions of the American founding fathers which were highly realistic with much textural variation, strong modeling, and an authentic likeness. Augustus Saint-Gaudens was America's greatest relief sculptor and technical innovator. Also trained as a cameo-carver, he developed a mastery in delicate cuts in shell and stone. Mount Rushmore is the most famous American relief sculpture. Inspired to "paint in bas-relief," he produced a group of portraits of artists and friends in Paris in the late 1870s. These were remarkable intimate, low-relief bronzes. His work inspired future sculptors toward greater experimentation and refinement. By World War I, relief sculptors pushed the limits of the art to more innovative approaches utilizing diverse materials, and modernist forms replacing the traditional standards. The most famous American relief is Mount Rushmore, the huge monument sculpture memorializing the great American presidents, started in 1927 and completed in 1941. Contemporary reliefs can be found in the façades and interiors of numerous buildings in the United States, such as the Supreme Court in Washington, DC and in many nations of the world. Many are in the classical Roman or Greek style while others reflect a more natural approach to form, even some in an unfinished style reminiscent of Michelangelo's later sculpture. Heilbrunn Timeline of Art History, "American Relief Sculpture", Metropolitan Museum of Art, New York. This page was last modified on 8 July 2015, at 21:50.